DIY Videos - always disconnect the power first. Free Estimates - The Truth. Washing Machine On, But Idle! Washing Machine Stops in Mid Cycle. Panasonic Corporation has launched its first washing machines into the European market with the introduction of three new models: a premium model (NA-16VX1), a deluxe model (NA-16VG1) and a standard model (NA-14VA1). The new washing machines feature 3D Sensor Wash, a drum rotation speed control system with 3D acceleration sensors to ensure high performance clothes washing, and Inverter technology which assists in lowering sensory noise and vibration. The three new models from Panasonic offer a wide range of state-of-the-art options delivering a reliable and affordable performance. To meet the rising needs in environmental preservation and energy conservation, Panasonic has incorporated energy-saving technologies in all three models. 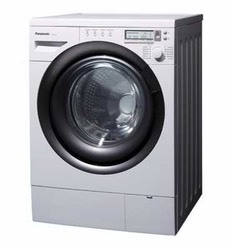 For example, Panasonic's premiumwashing machine, the NA-16VX1, operates to the prestigious EU A-20% energy efficiency standard and so uses 20% less energy than an ordinary A-category washer. Also, combined with the highly innovative inverter, tilted drum and 3D sensor technologies, the three models are able to realize a high washing performance resulting in a shorter wash and using less water in the process. All these technologies are unique Panasonic ideas developed by in-house engineers. All three models use 3D Sensor Wash technology to modify motor rotation and output for best possible washing performance. By tilting the drum at 10°, Panasonic has lowered the water level in the drum. This makes for enhanced control of drum movement and washing action. Even though the models use less water, the clothes are still rinsed well and freed of detergent residue. As the advanced 3D sensor in the NA-16VX1 detects how the drum moves according to load, a variable speed control system uses that information to fine-tune motor operation. This eliminates unbalanced loads and creates an ideal three-dimensional washing effect. The result here is less stretching, less tangling and fewer wrinkles — and an altogether gentler effect on the clothes in the wash.